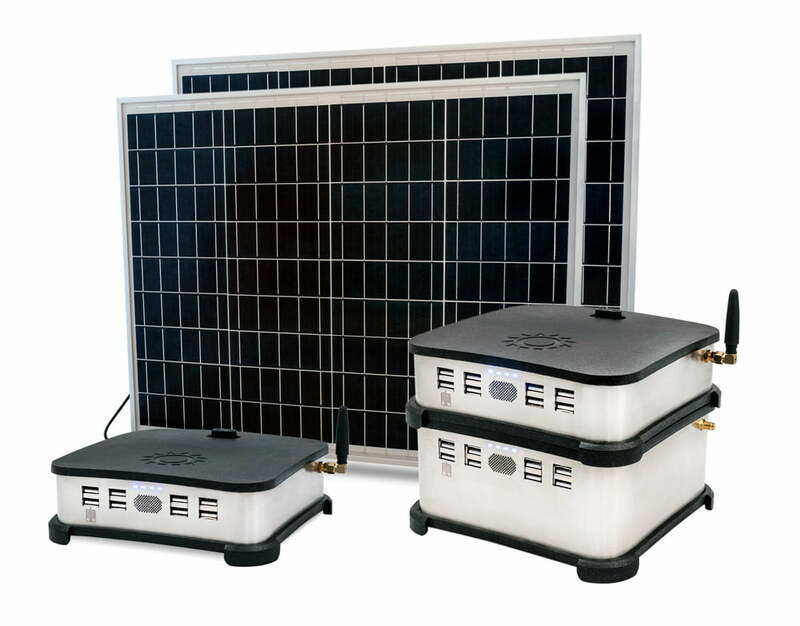 The SolarWorX offgrid system is unique on the market, as it combines high quality state of the art technology with an affordable and flexible modular approach. It is Pay-as-you-go compatible allowing it to be used also in low income markets. The simple, yet perfectly to the target market tailored design keeps production and distribution overhead low, allowing a just in time assembly near the targeted customers, which leads to more value creation and knowlegde transfer in the rural offgrid regions of Africa, South America and Asia. With our Grid-module single Solar Homes Systems can easily build a DC microgrid. Electricity can be purchased from neighbors (e.g. for the operation of energy-intensive appliances) or sold to them in the event of surplus production. 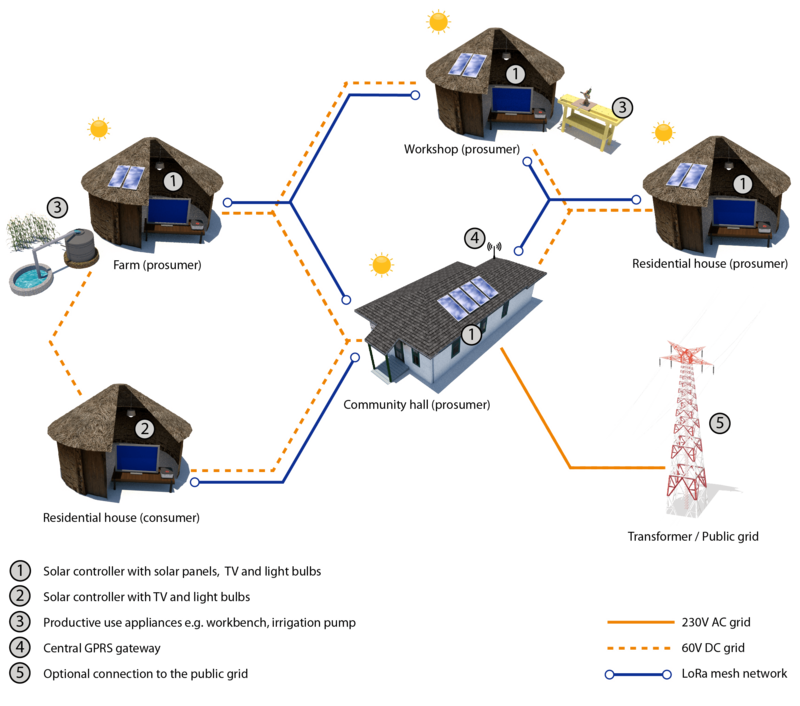 A robust and innovative LoRa mesh network enables the energy trades on a village level. Two different battery-module-sizes of 80Wh and 160Wh can be stacked to increase energy autonomy. Connect up to two 50W solar panels to each battery-module. A connection to the grid is not required. However the system can be connected to a public utility or become a micro-grid of its own by interconnecting neighbour systems. The system informs you about the current status in local languages such as English, French, Swahili, Wolof. Illiterate customers will be able to handle the system. Clean solar electricity with highly efficient dimmable LED lamps substitute harmful kerosene lamps. The case of the system is CO2-neutral. Benefit from high product quality engineered in Germany and spend your money where you need it most with pay-as-you-go. Start an out-of-the box phone charging business, expand opening hours after sunset or set up a new business with reliable electricity. The Solar System not only ships already with a bunch of the most important appliances such as lights, radio and phone charging adapters included, but also, with help of power adapters allows you to connect virtually every 12V appliance out there. And with the possibility to connect power inverters, even AC power tools can be used off-grid! No traditional switch is needed for our contactless lamps. By motion detection you can switch and dimm the lights. Our basic 80Wh/ 160Wh Solar Home Systems come with highly efficient appliances, such as 2/4W LED bulbs, a security light, TV and radio. Use the USB ports to charge up to 7 devices such as mobile phones at once. A keypad is included to unlock the system if the Pay-As-You-Go feature is activated. Use the power of the sun to irrigate your fields or fill a water tank. With our robust submersible water pump up to 2500 liters can be pumped per day. Whenever your energy demand rises you can add anonther Solego base system and connect an additional solar module. Start an out-of-the-box charging business by charging 40 mobile phones per day, open a hairdressing salon or extend shop opening hours with our highly efficient LED bulbs. There is a whole variety of business models coming with our Solego systems. If you are interested in our ambitious future plans please don't hesitate to contact us. Distributors are welcome to get in touch with us and join our growing network of distritution partners.